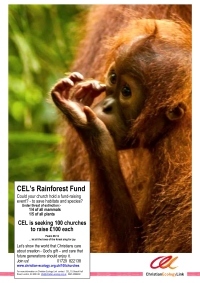 Could your church raise £100 to save an acre of rainforest? 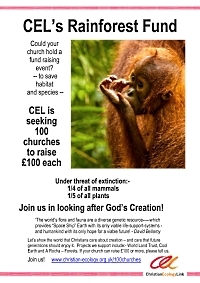 for habitat conservation projects - Could your church help? Which churches have taken part so far - is yours here? 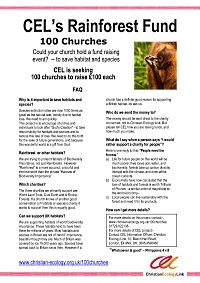 Could your church have a fund raising event? We want to show the world that Christians care about the gifts God has given us – and care that future generations should enjoy them too. Genesis 1 - God saw that is was good. This is God's world we live in, his gift to us. We owe it to him and to future generations to look after it. The trees and the endangered animals cannot speak. The indigenous tribes and poor farmers who are thrown off their land by rich plantation farmers have difficulty being heard. The beauty variety and intrinsic worth of species of forest, sea, tundra and swamp is vast. .. as vast - or significantly more vast - perhaps as some of the material things we have to raise money for in our church buildings. There may be opportunity to invite conservationists and wildlife amateurs or experts to you church who are not members of your church - and new friendships and opportunities can ensue. 3. Rainforest or other habitats? CEL can suggest projects to support. 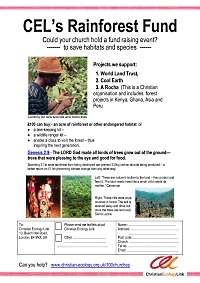 We recommend:- World Land Trust, Cool Earth and A Rocha Ghana. See blog about fundraising for them. 100 churches project - Posters (doc files) to download and put in your church - choose which is suitable for your occasion - whether to print as A5 handouts, or to blow up into a huge poster.